With fresh colors, modern fabrics and a classic style, the 2017 collection from GenTeal is great for the golf course but equally suited for a tailgate party or a special dinner. While traveling the South Carolina coast back in May, I was looking around the pro shop at Dataw Island Club and was impressed at the variety and quality of apparel brands. 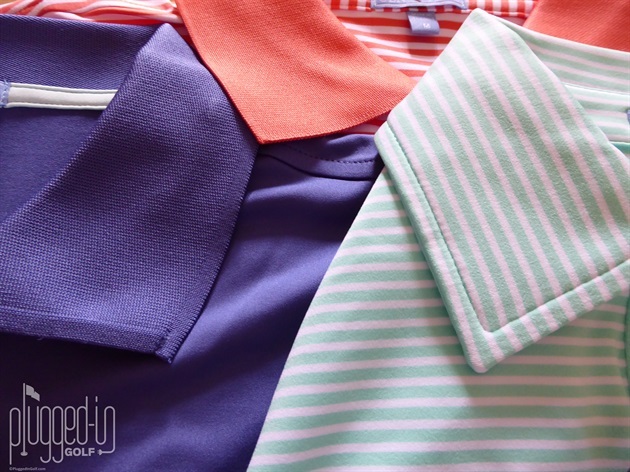 A rack of polos caught my eyeand low and behold it was a brand I’d never heard of – GenTeal. Turns out GenTeal was launched just a year earlier by co-founders Brice Noonan and Blake Dubinski. I don’t know if it’s a curse or a blessing to have the last name of Noonan, but Brice seemed destined to be in the golf business. Performance is imbedded in the names of GenTeal polos and outerwear for a reason – they’re designed to perform on the golf course. The moisture wicking 92% poly/8% spandex blend performed admirably in hot and humid conditions, including a 36 hole day at Spirit Hollow. The spandex gave the fabric great stretch for complete freedom of movement. I had hoped for some cool mornings to test the Heritage Blue Performance ¼ Zip, but had to settle for a delayed flight in a very cold airport. The lightweight, soft fabric was perfect for providing a bit of warmth while lugging around an overfull backpack. 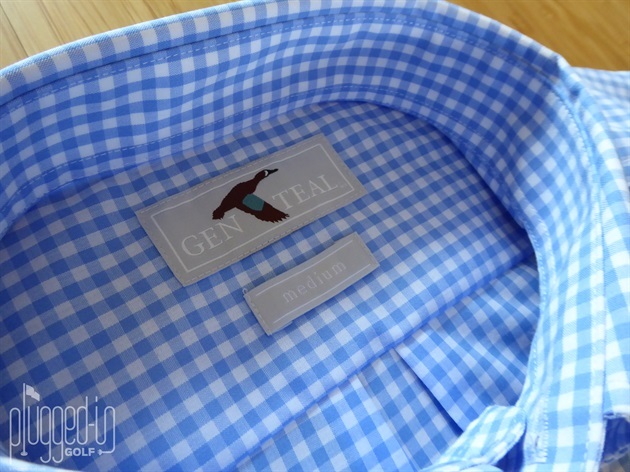 The blue gingham sport shirt from GenTeal deserves a shout-out in this section for its wrinkle resistance. I despise ironing, and this 100% cotton shirt comes out of the dryer crisp and ready to wear. GenTeal’s apparel line has a timeless, classic style – simple stripes and solids, but with fresh and current colors. The collars are slightly big, reminiscent of the days when Palmer and Nicklaus stalked the PGA circuit. While on the subject of collars, GenTeal added sewn-in collar stays to all their polos for 2017. I’ve had this in self fabric collars, but this is the first time I’ve seen in rib knit collars like the Marlin Solid Performance Polo. The Marlin Solid is so much more than the name suggests. What you don’t easily see on their website pictures is the wonderful contrasting colorway on the button placard and around the shirt tail split. Based on the size chart, I went with my typical medium. The polos seemed a bit roomy so I reached out to Blake for some guidance and learned that GenTeal offers a generous fit. GenTeal was gracious enough to send a small for comparison, and for me at 5’-10”, 165 lbs, the fit was excellent – not tight or too loose. For comparison, Blake wears medium and tells me he’s 6’-1” and 180 lbs. Shirt sleeves start at the widest part of your shoulder and cover the bicep. Discovering a new brand is fun and even more exciting when it turns out to be high quality, functional, and fashionable like GenTeal. 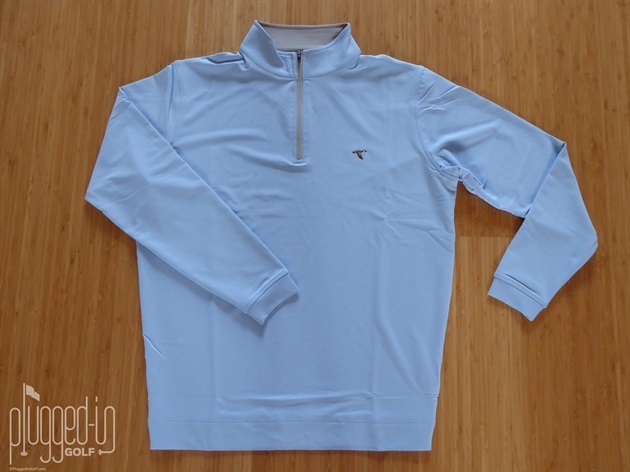 The logo, a blue-winged teal, is simple and unassuming, keeping the clothing appropriate for off the course functions. 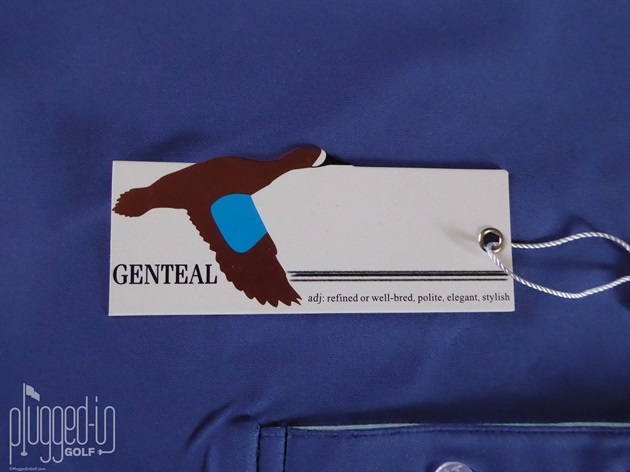 If you’re searching for something fresh, with a fit that works for the average guy, GenTeal is worth a look.